Presentations can be dreadful. Badly thought-out slides, boring structure, poorly delivered. I once told a colleague after a practice talk to please shoot me before she’d ever make me sit through such a talk again (to be fair, she had called the talk boring herself before she even began). Instead of suffering through more bad presentations, Jon Schwabish decided to teach people how to make them better with his book, Better Presentations. And it’s badly needed. Jon covers both constructing the presentation (structure and slides) and delivering it. The latter is often neglected. Many people spend lots of time on their slides, but never bother to rehearse their talk or think of good openings and endings. Along the way, you learn many useful tricks for preparing figures for slides (including many interesting points about the difference between figures to use in a paper versus a presentation), using text and images, etc. There are also some good points about combining text and images. I generally avoid text as much as I possibly can, often using single images on my slides. But now I’m thinking I might need to include a bit more text as well (I realize that this is the opposite problem of most people, though). It’s for the audience, not for you! The book is organized around three principles that are easy to get behind: visualize, unify, and focus. Jon uses those repeatedly in each chapter and ends each with a short summary centered around them. While much of the book talks about slides, Jon suggests creating the structure and flow of the presentation away from your presentation program. Just doing that is a big step in the right direction. He also has some good ideas about structuring the presentation in a way that is both interesting and not entirely opposite the usual academic-style presentation. Better Presentations is a helpful guide for anybody who regularly gives talks based on research. Or anybody who gives any kind of presentation, really. 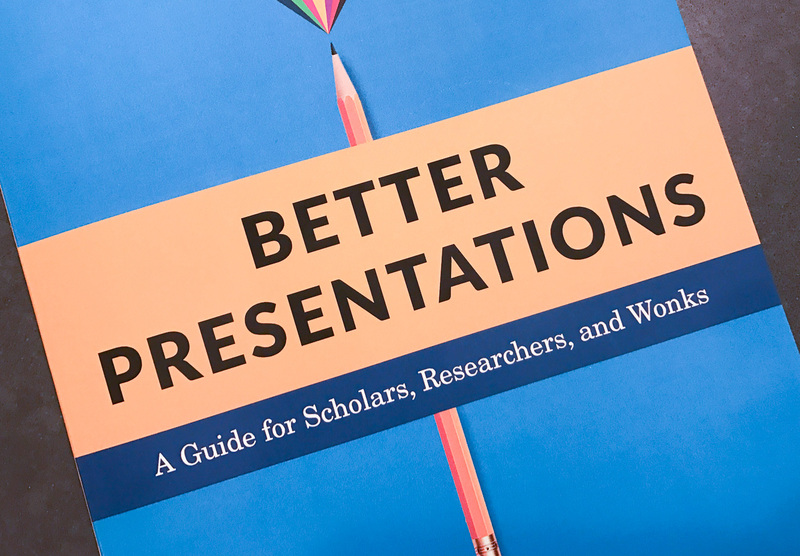 Jonathan Schwabish, Better Presentations: A Guide for Scholars, Researchers, and Wonks. Columbia University Press, 2016.